It's the coffee giant's second attempt in five years to grow an artisan bakery chain. The Italian-style bakery on Westlake Avenue about a block south of Denny Way will feature breakfasts including baked eggs and pastries; pizzas, soups, salads and sandwiches at lunch; deserts and breads. Coffee will include a Starbucks blend designed for the bakeries, and espresso beverages. It will also serve cocktails, beer and wine — the latest effort in Starbucks’ ongoing quest to drive sales in the afternoons and evenings. 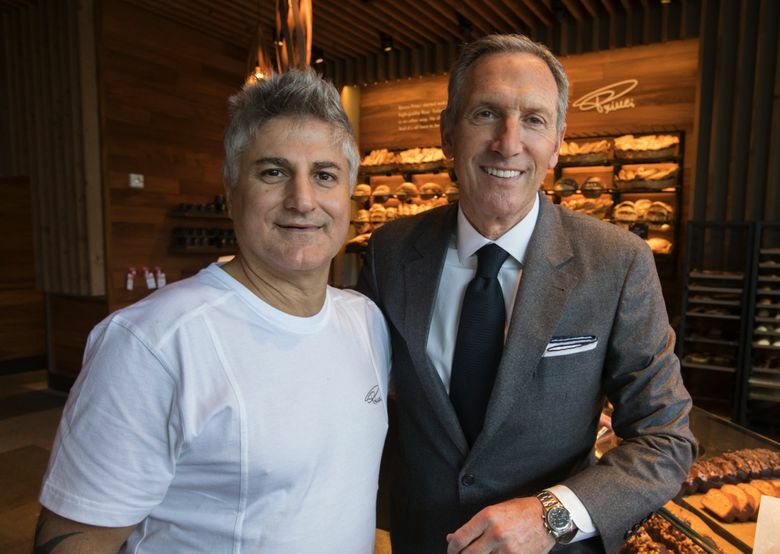 In 2016, Starbucks then-CEO and executive chairman Howard Schultz tapped Milanese baker Rocco Princi as a food purveyor for the company’s new high-end retail formats, including its showpiece Roastery and Reserve stores. These are part of the Siren Retail strategy Schultz devised to appeal to coffee connoisseurs and bolster the broader brand cachet. The licensing and investment deal with Princi followed Starbucks’ decision in 2015 to close 23 locations of La Boulange, a bakery chain it acquired in 2013 for $100 million. La Boulange recipes are still used for pastries sold in Starbucks stores, a company spokeswoman said. Schultz said in an interview last fall for the opening of a Princi outlet inside the Capitol Hill Roastery that he envisions more than 1,000 stand-alone Princi stores, and 1,000 or more Reserve stores offering Princi food. That’s a far cry from the chain’s modest footprint today. There are five stand-alone locations in Milan and one in London, predating the venture with Starbucks. The Seattle Princi will be followed by locations in Chicago and New York, set to open in the fall. Princi’s lineup will also be sold in Roasteries scheduled to open over the next 18 months in Milan, New York, Chicago and Tokyo. Since Schultz announced his departure from Starbucks, investors are watching closely as the company manages through slower-than-expected sales growth and the company is placing greater emphasis on U.S. markets in the South and Midwest where it has fewer stores. CEO Kevin Johnson said in June that the company is still evaluating the economics of the Roastery stores and described the Reserve store format as being in “concept phase,” with a financial evaluation to follow the build-out of six to 10 locations. Outgoing chief financial officer Scott Maw has said the Siren Retail segment would not break even until beyond 2019.